Now that fall has come and is gearing up to be in full swing, we’ve already started thinking about how excited we are to rotate our home decor scheme. Each year as the seasons change, we love following suit inside our house so that the decorative pieces visitors see when they come over coincide with the weather outside and whatever holiday is the closest. Perhaps even more than we adore the passing of the seasons, however, we love the fact that changing over our home decor periodically gives us an awesome reason to get creative and DIY with the pieces we display! There are few things we feel as enthusiastic about as putting our crafting skills to good use in a way that makes our home look happy and cozy, no matter the time of year. 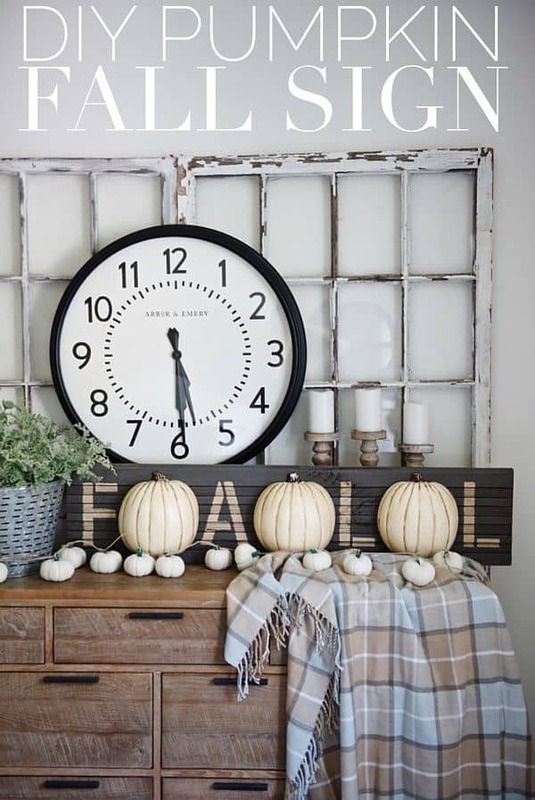 That’s why we’ve been on the lookout for DIY fall decor inspiration! 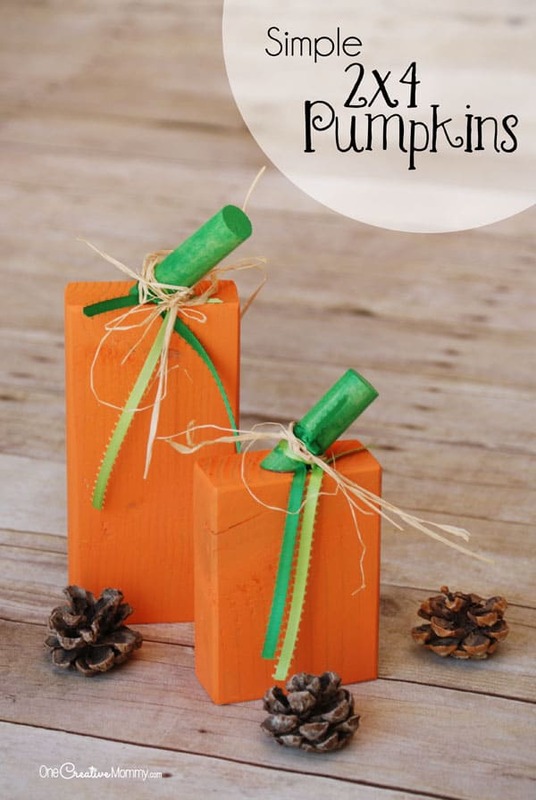 We’re always very busy indeed around this time of year, so the idea of finding fall crafts that are cute and simple is always a dream! 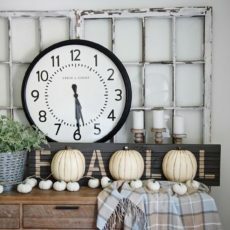 Just in case you’re feeling as enthusiastic as we always do about the idea of making your very own DIY fall decor pieces, it not more, here are 15 of the best and most unique designs, ideas, and tutorials that we’ve come across so far in this year’s search. Are you the kind of crafter who has always adored working with letters and quotes, especially if you get to make more structured things rather than just painting with words on canvas? In that case, we have a feeling you’ll get along very well indeed with a tutorial like this one from Homemade Interest that outlines the process of doing some yarn wrapping around cardboard letters in order to make cute, colourful mantel stands. 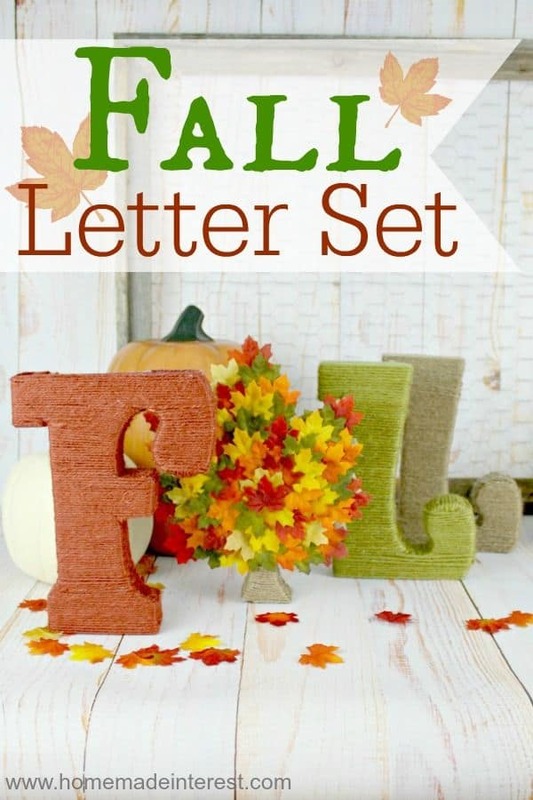 We love the way they replaced the A in “Fall” with a cute DIY autumn tree! Has your favourite part of fall always been the way the leaves fall and cover everything in a thin, crispy later of red and orange shades but you can’t help wishing that you could actually authentically include some of those leaves you love so much in your indoor decor too? 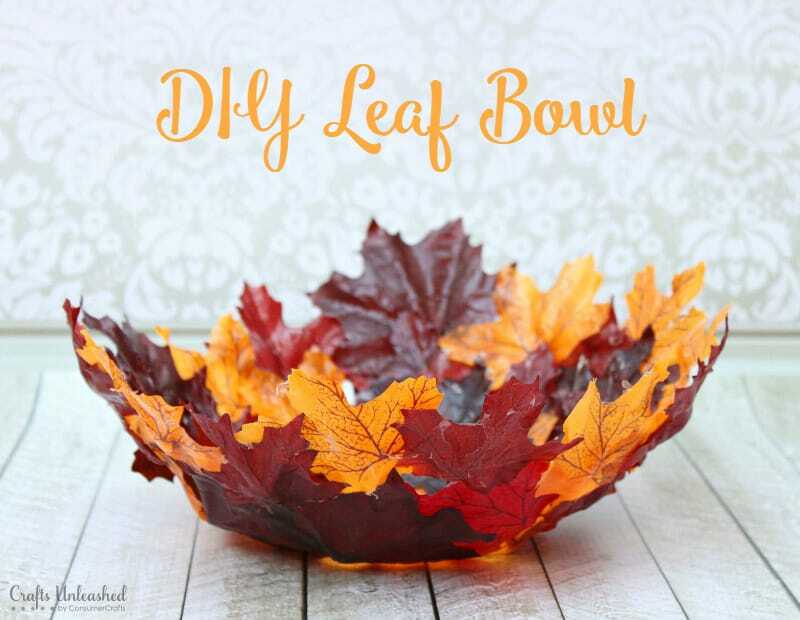 In that case, we think this amazing homemade leaf bowl, outlined step by step on Crafts Unleashed, might actually be right up your alley! This project will put your decoupage skills to good, unique use. Did we kind of catch your attention when we started talking about yarn wrapping techniques because you’ve always loved working with yarn and string, but you’re also still scrolling hoping to find something a little more challenging than what you saw there? 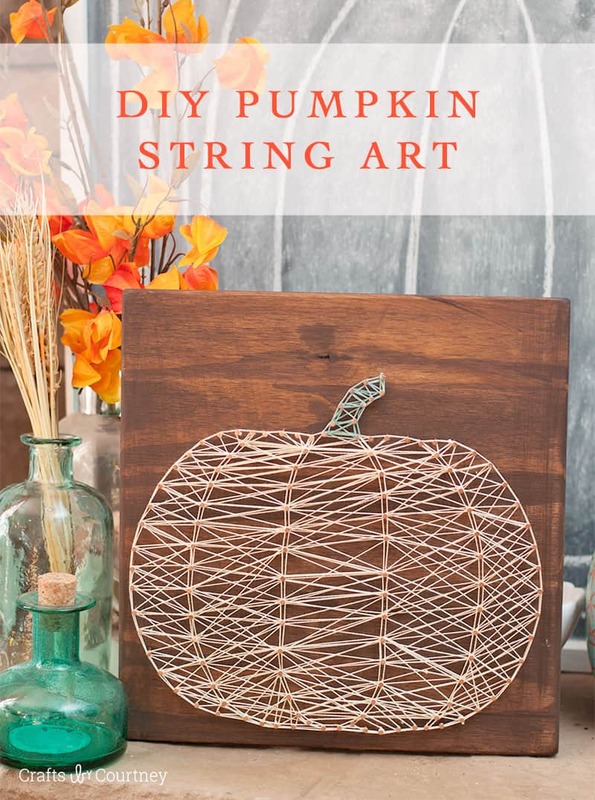 Then we’d definitely suggest taking a look at how Crafts by Courtney made this fantastic interwoven string and nail art pumpkin, which they’ve outlined step by step nice and clearly in their tutorial! Were you quite intrigued by the idea of using real leaves in your DIY fall decor scheme but what you really appreciate the most about them is their shape so you’re not feeling that attached to the idea of keeping the leaves themselves in the project? Then we think you might appreciate the way The Idea Room used them as an outline stencil! 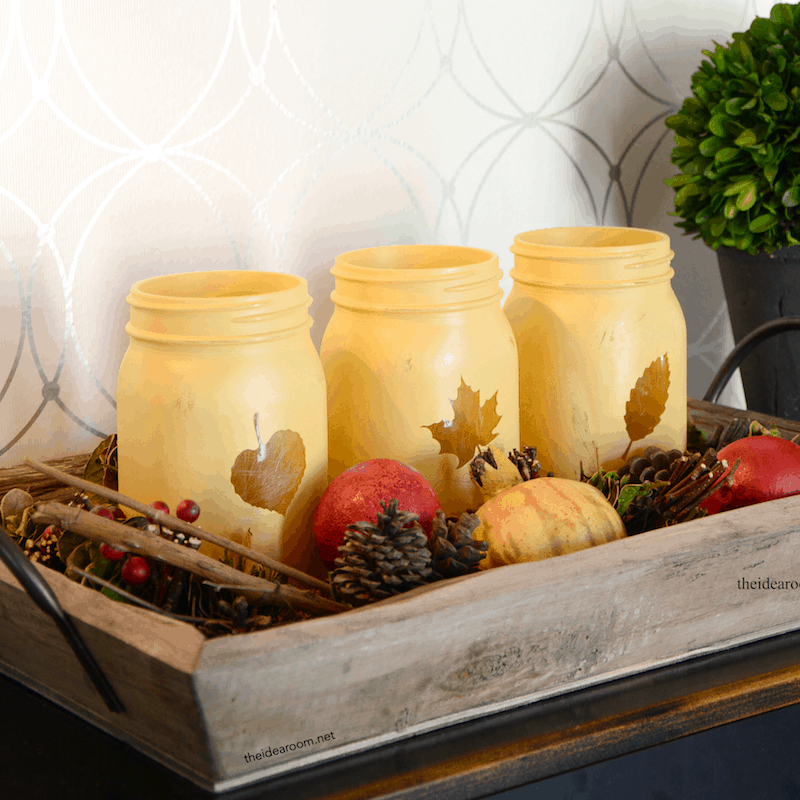 Check out their tutorial to learn more about painting carefully around leaves to make these fantastically decorative fall mason jars. What if you actually liked the basic concept of the idea we just showed you above but you kind of want to keep the leaves you’re painting around involved in the project? 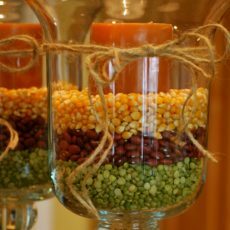 Perhaps you’re just looking for a way to turn your painted mason jars into something because you’ve always loved adding a little extra to anything you make. In either case, we think you should absolutely consider making something like these fall leaf mason jar lanterns outlined on Parenting From the Heart. Are you the kind of enthusiastic fall enthusiast who starts buying little fake decorative pumpkins and real pumpkins alike the very moment you see them start appearing in stores each season, so suddenly you’re facing the start of the season with all these adorable pumpkins that could use a cute, decorative twist? Well, regardless of which kind you’ve got, we think you might like the idea of adding a little bit of colour and pattern by covering them in fancy fabric tape, just like Somewhat Simple did here! Were you very intrigued indeed about the idea of creating fall decor with yarn because you think that’s a good way to use up some of the spare scraps or yarn ends you’ve had sitting around for most of the year, but you’re just not sure that the letter wrapping or string art ideas are quite right for you because you’ve done those so many times before? 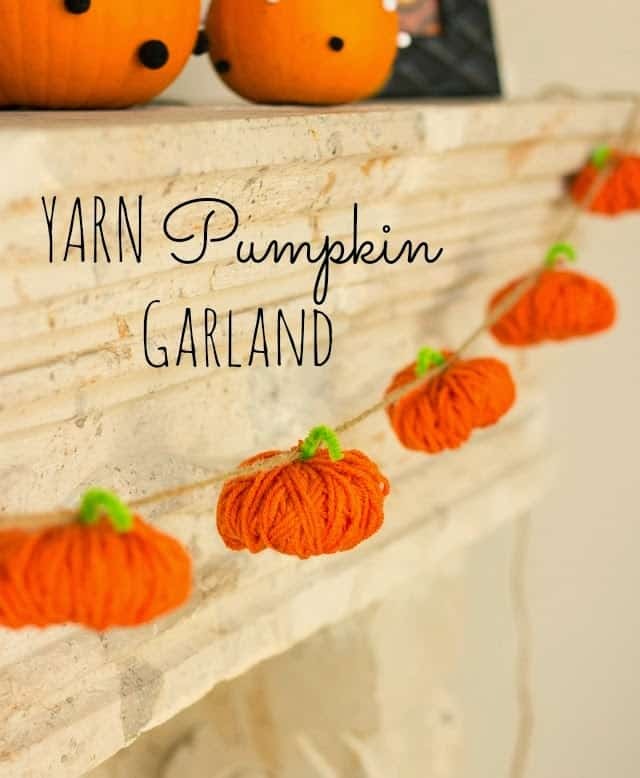 In that case, we think you might get along a little better with the way Design Improvised balled their yarn and made adorable little pumpkins, stringing them along together to create a cute fall bunting! 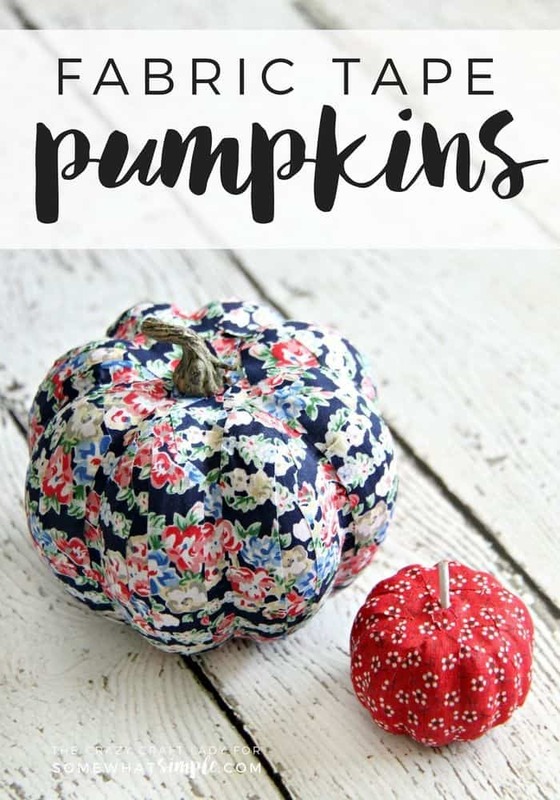 Now that we’ve started talking about ways to make adorable little pumpkins out of crafting supplies or unconventional materials, have we got you thinking about what else you can use? 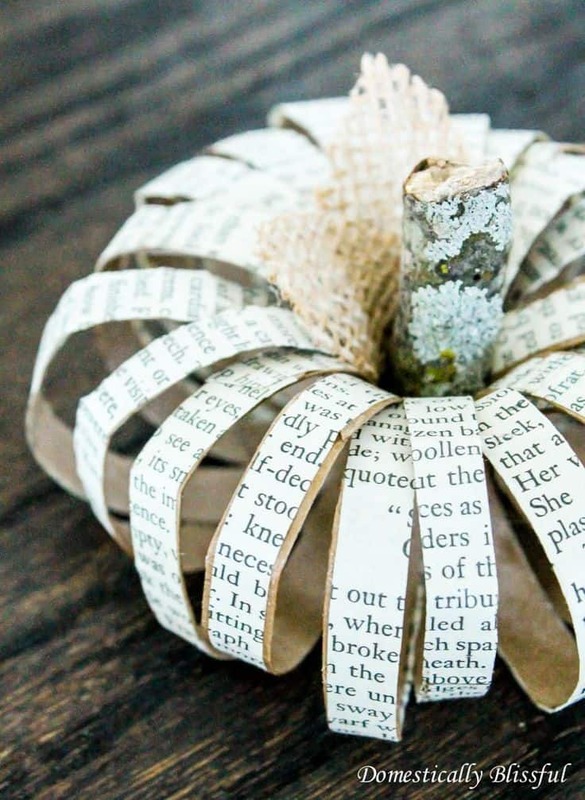 Well, if upcycling has ever been up your alley, then we’d definitely suggest taking a look at how Domestically Blissful used old book pages from damaged books and folded them into a rounded shape, fastening them to create a cute little pumpkin around a piece of branch. Do you actually already have some decorative class containers or vases that you usually leave sitting out but you’re wondering whether there might be a way to customize them temporarily for fall so they fit into your seasonal decor plans better, without changing them permanently? Well, have you ever considered filling them with seasonal things? 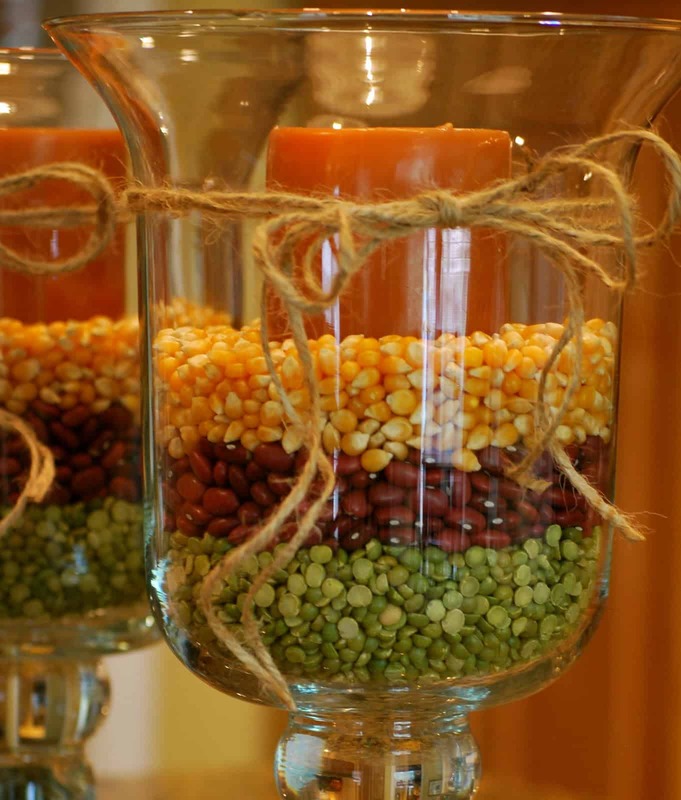 We’d definitely suggest taking a look at how Clipgoo filled their glass vases with seeds, corn, and dried beans in laters and nestled a candle right in the centre. Did we actually really catch your attention when we started talking about fall decor ideas made with upcycled book pages but you’ve already made a few pumpkin shaped projects this year so you’re hoping to create a different kind of craft instead? Then maybe you’d get along a little better with something like these book page leaves outlined step by step on A Delightsome Life! We love the way they show you how to turn the leaves into several pieces of decor, including a wreath and a garland. Despite your clear love for pumpkins, since they are the fall classic that everyone who is an autumn enthusiast adores, do you also enjoy paying tribute to other fruits and vegetables that are seasonal in fall when it comes to making your own fall decor? 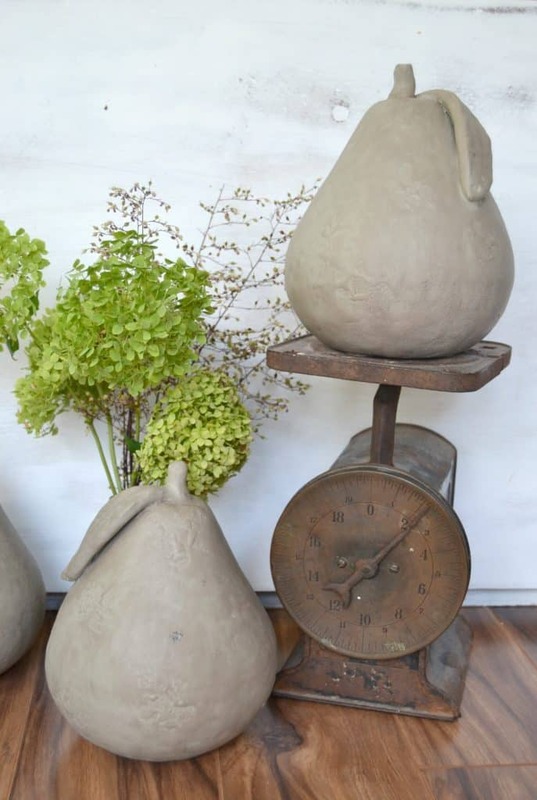 Well, we’re not sure pears would be the very first thing to come to mind, but we do think you’ll enjoy seeing how My Creative Days made these faux concrete ones that are rather impressive looking indeed! Have you been thinking about the whole upcycling idea and taken a look around your home, garage, and yard to see what kinds of things you had available, but all you found were some pieces of unused wood? Well, that might not seem like a clear fall project tool immediately, but that doesn’t mean there aren’t ideas out there! 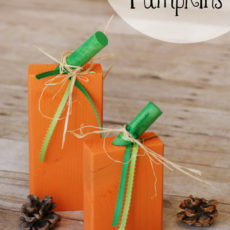 These adorable painted 2×4 piece pumpkins are the perfect example of what we mean. Get the full details for making your own on One Creative Mommy. 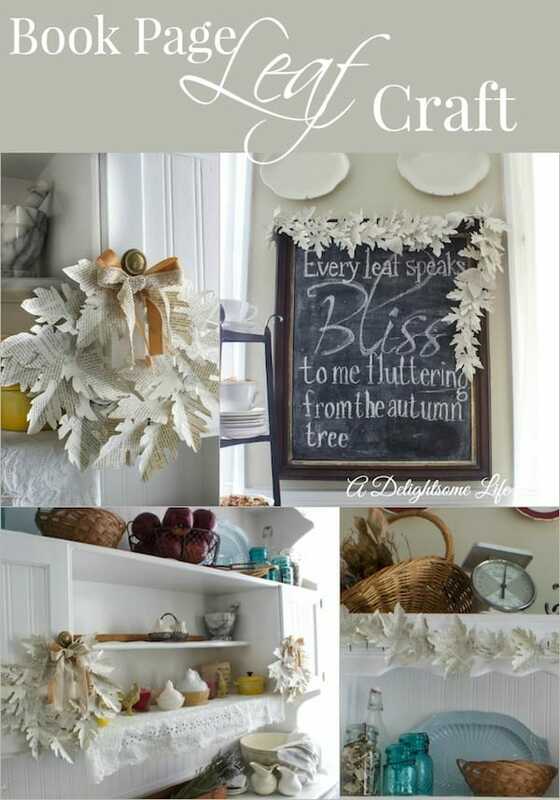 Were you very intrigued indeed by the idea of creating some kind of simple mantel or side table art that says “fall”, since you are the word art loving crafter we referred to earlier, but you’re still just not sure that yarn wrapping and 3D letters are quite up your alley? Then we think you might prefer this alternative idea from Beautiful DIY Crafts that shows you how to create a painted wooden sign that features a very realistic looking 3D pumpkin between each letter. Were you actually a very huge fan of the way the rounded pumpkins made from book pages looked but you don’t currently have any books that you’re willing to strip the pages of? Well, we can’t say we blame you for a moment, but we are pleased to report that there’s another way to made a similarly structured pumpkin piece so long as you have some old mason jar lids to work with! Get the full details for making the rings wrap like in the photo you see above on Southernly Splendid. Do you actually live in a place that stays quite warm late into fall, so you usually try to include some kind of floral aspect in your fall decor because you love that your bouquets and blossoms will stay looking lively until it’s nearly winter time, rather than being killed by early frost? 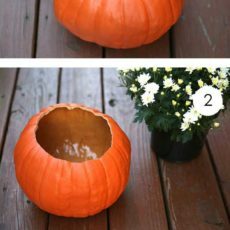 In that case, we think this adorable faux pumpkin turned flower pot idea outlined step by step on The Home Designs might be right up your alley! We love how impressive this idea looks for how truly quick and simple it is. Have you made other fantastic and adorable fall crafts recently that you very much enjoyed and still have on display but that you don’t see anything quite similar to here on our list? Tell us all about what you made and how you created it or link us to photos of your finished product in the comments section!